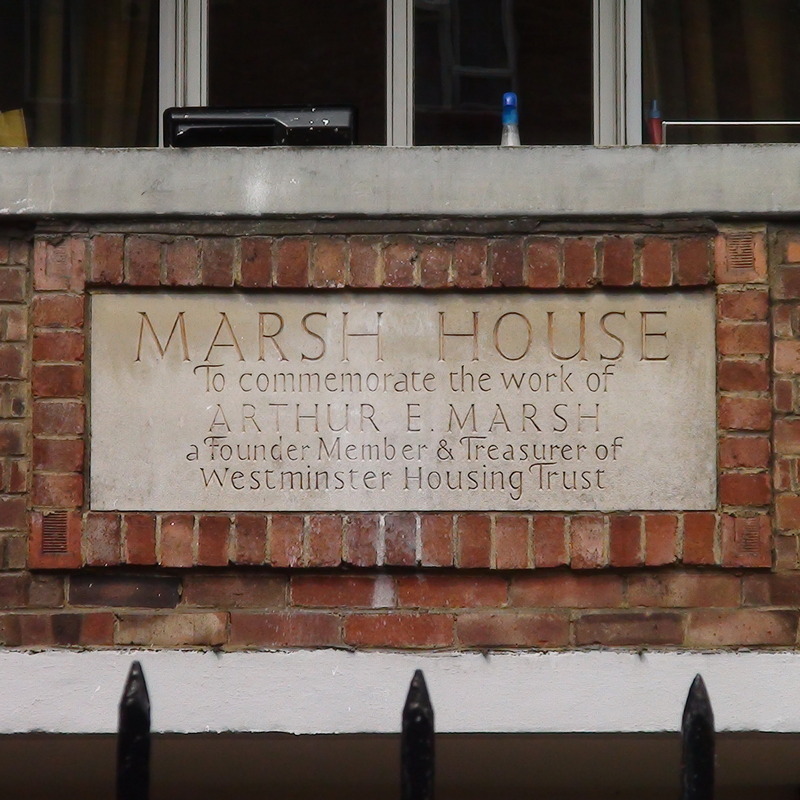 To commemorate the work of Arthur E. Marsh, a founder member of Westminster Housing Trust. Pulford Street and the Equitable Gas Works used to occupy this six acre site. In the 1930s the Pulford Street Site Committee was responsible for raising the funds necessary, mainly from Westminster residents, with grants from the Ministry of Health and Westminster Council, to build this Tachbrook Estate. The National Archives provide: Seven 5-storey blocks (Kent, Founders, Wren, Beaufort, Tuttle, Abbots, Cowper) (totalling 180 flats) were built and opened by the Duke of Kent on 8/7/1935 (plaque says Duchess of Kent on 27/6/35). Walston House, opened by the Duchess of Kent on 29/6/1937, was built as a social centre but was rebuilt as 22 flats for the elderly in 1970 and now has no plaque, that we could find. Malcolmson House, actually 3 blocks (100 flats) was opened by the Queen Mother on 14/7/1949 (plaque says 13th). Cockburn (22 flats), Marsh (17 flats) and Harvey (41 flats) were opened by Princess Margaret 22/10/1953. The whole Tachbrook Estate was transferred to Peabody Trust in 1972. On site there is a plan showing the location of each of the 14 blocks. One of the blocks, Walston, is quite modern and does not have a plaque. There are 3 Malcolmson blocks (A, B and C), only one of which has a plaque. The Foundation plaque is additional to the standard one on the Founders block. The Opening plaque is additional to the standard one on the Cockburn block. The Murray plaque is in the playground, not on any block. All of which means there are 14 plaques: 5 to historical figures and 9 to founders, administrators, unveilers.